Greetings from Philly! I hope everyone’s doing well. I remember years ago we all used to meetup to talk about crypto and show off mining rigs people were buying. While I never got into it (too busy growing plants) I’ve jumped on the bandwagon last year and now have my own fleet of miners trying to find Litecoin blocks. I also did some work solo mining despite the worlds recommendation not to. Suprise surprise, it works but it’s exactly what people say, you go a long time without any blocks and the variance between finding blocks is very high. I’m working on setting up a machine image for solo merge mining scrypt-based coins (mirroring how litecoinpool.org works). I get a lot of people with large operations contacting me about this because they really want to mine solo but just can’t figure it out at scale. Right now, I have one colleague in the UK solo mining with 12 L3+ miners and he’s found blocks. I tried to set up a solo op for a fleet of 195 L3+ units based in Canada but the setup just could not handle that load and no one wants to give up their money making machines for testing. Four year ago I was having fun Alt-Coin mining. 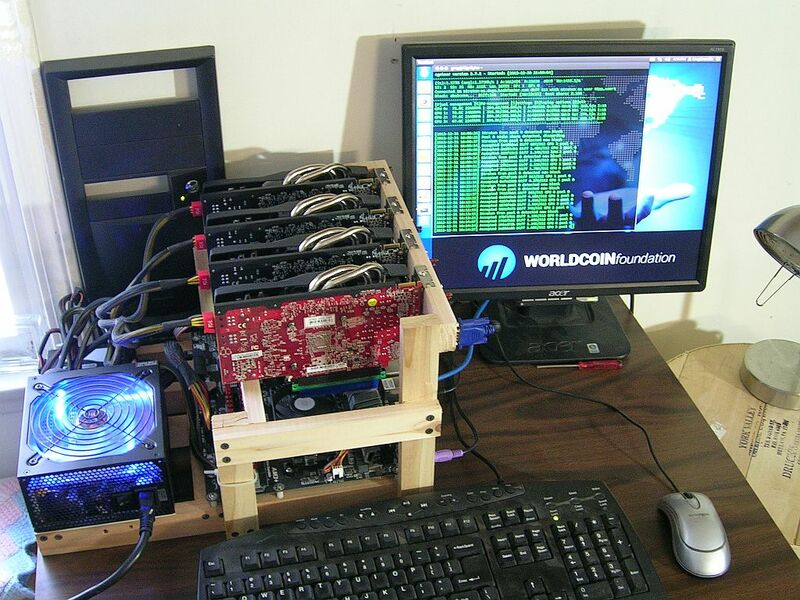 I had built a Scrypt mining rig out of 4 Radeon HD7850 GPU’s. They were quite fast back then, but useless by todays standards. I believe the power consumption was somewhere around 650 watts total. My house has electric heat, so I figured the electricity was basically free because I’d be using it anyway. I only mined for about 5 months total. Once spring came my computer room started to get too hot and mining profitability had fallen off significantly. When I first started I was able to mine $15 to $20 worth of AltCoin each day. But that didn’t last long. I mined whatever Scrypt coin was most profitable at the time. I’d watch coinwarz.com and switch to a different coin to keep things interesting. I mined Litecoin, WorldCoin, DogeCoin, and a few others. Towards the end DogeCoin was consistently the most profitable. I never held any of the AltCoin for much more than a week or two.I always traded it for BitCoin on Bter or some other exchange. I always mined in a pool. I can only recall being the person that found a block in any of the coins I mined one time. In my case, pool mining was definitely more profitable. It is the luck of the draw though. Pool fees were only 1% to 2% back then and it seemed worthwhile in order to see a nice slow but steady accumulation. In the end I multiplied my investment many, many times over. I only wish I had kept all of the BitCoin because I spent almost half of what I had accumulated at one point. I was hedging my bet though - probably a wise thing to do. I think the future of BitCoin and all AltCoins is sketchy at best unless a true solution to the scaling problem is invented that does not sacrifice security or decentralization. Lightning networks or other currently proposed side chain solutions are clearly not the answer in my view. I really think that Cryptos are between a rock and a hard place right now as far as mass-adoption is concerned. I’m hoping for a new breakthrough that will solve these problems. 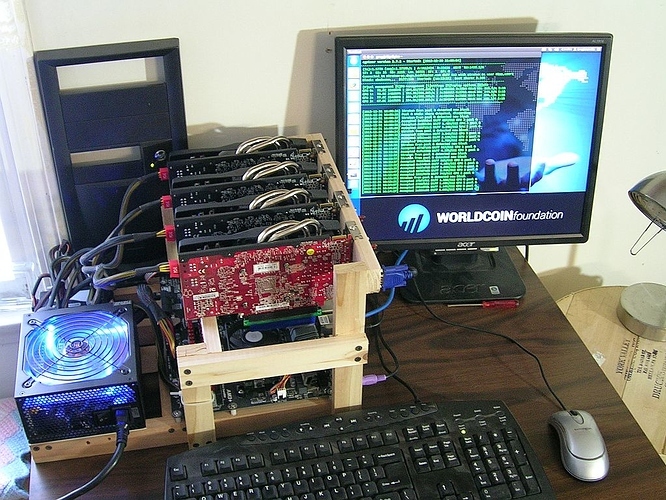 Anyway, here is a picture of my old Scrypt mining rig from 4 years ago. MIKE!! So happy to hear from you! I did a bunch of tests on my existing equipment (no investment in new equipment planned currently). I found out that at the time, ZCash would be the most profitable for me. I’ve been mining it at home since. The electricity cost has been roughly zeroing out the profit made just on ZEC, but I’m slightly profitable so far by trading ZEC with BTC, ETC, LTC, and others. More of a hobby than anything, and I should really re-test to see what would be most profitable now. I’ve never even considered solo mining. My gut feeling was that a regular stream of coins is worth the fees, knowing how you’ll stand in the future when trading. I could be wrong, and will look into solo mining. I only wish I had kept all of the BitCoin because I spent almost half of what I had accumulated at one point. I was hedging my bet though - probably a wise thing to do. That’s the story for most of us. I’m not disappointed, no one could have honestly predicted prices north of $10K. I had around 85 bitcoins years ago, and cashed out at one point and made $700 net. Can’t be ashamed of that, even wishing I had even a single bitcoin lying around that I never touched. Very interesting to see how big people are going with this. I like the concept of collecting the transaction fees as a solo miner. All more of a hobby since I just enjoy messing with computers. I used to just track current mining profitability on coinwarz.com. There was at least one other site that I also used that provided similar information (can’t recall the site name right now). You input your hashrate and select the type of coin and it gives you current profitability data. The statistics can change quite rapidly sometimes, so you really have to look at trends to a certain degree. My gut feeling was that a regular stream of coins is worth the fees, knowing how you’ll stand in the future when trading. This is very true, really the solo mining is best for large mining operations. I helped this dude in Canada get setup, he’s got 200 L3+ units so 0.1 THS mining Litecoin. He was mining in a pool and seeing like 1 block found every day but his daily earnings were only like 60% of what he’d get from a block. I don’t know how they actually distribute earnings but seemed like he was getting ripped off. Over the course of a week, he had found 8 blocks in the pool and only made like 160 LTC vs the 200 he would have made mining solo. This was on litecoinpool.org. Plus, now we’re working on merge mining which will earn him even a bit more. At a small scale though, it’s just depressing to mine solo since it takes forever to find a block. This is what I’m doing, my mine isn’t small scale but it’s nothing that I’d consider large scale either. I just started myself a few weeks ago (well, maybe for the second time - but the first didn’t count as far as I’m concerned) and have been using NiceHashMiner - which is supposed to watch the market for you and only mine the most profitable at that moment - then pay you out in bitcoin. Based on my calculations, I should be bringing in about $1000 a year at today’s bitcoin prices with $200 of that being electricity costs. Granted, this is just a side-gig for my gaming PC with a 1070 in it… nothing elaborate or built specifically for mining. I’m curious as to why you’re picking a coin to mine and sticking with it? Hey @Ohm! Glad to hear from you. I actually go at started with multipool.us which is a switching pool. I wish I had stayed on that cause all the altcoins I was getting have since 5x - 10x’ed in value… oh well. Why just mine litecoin? Well I hold litecoin and I transact with it so I momentarily litecoin to support the network which I depend on. Thinking Metcalfs law applies to these currencies. I have gotten merged mining figured out so I merge mine litecoin with dogecoin, viacoin, and myraidcoin. Its really just that I like litecoin so I mine just that. Also a long term believer that holding litecoin is a good crypto to hold, has utility and community. The solo mining isn’t really the smartest thing so far, hard to trouble shoot since block times are a while and there’s a lot of variance. Finding a block is a stocastic process, very much like rolling a die of flipping a coin. The probability of finding a block (generating a magic number) is very low since so many people are trying to do it. Calculators say my estimated time to find a block is ~50 days but it could easily be 150 days before I find a block. So, when I’m trying to trouble shoot, I can run in test mode and find a bunch of blocks, but when I’m running in production, it’s just very depressing to go 50+ days without a block, hard to tell if it is even working anymore.